Aruna Lama a well known singer of the Nepali Music World popularly known as "The Nightingale of the Hills".She captured the heart of thousand Nepali music lover all over the world specially Nepal and Darjeeling hills.She was born on the 9th of September 1945 at Ghum Pahar, Darjeeling to father Surya Bdr. Lama and mother Sanmaya Lama.She started singing at an early age of 7 and kept moving ahead unless the entire music lover loved her more than anything else. Aruna Lama got married with Mr. Saran Pradhan who was also a well known musician during those those days. But he left her soon with two little children. Schedule caste and Tribes Wrlfare Offfice Darjeeling. at age of 11 where she sttod first and after that she never looked back. Swar Samagri (Arunanjali Programme, Kathmandu). 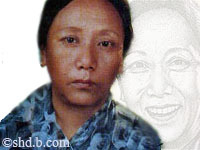 She died on February 4, 1998 at Kathmandu, Nepal but her voices are still alive in thousand heart.